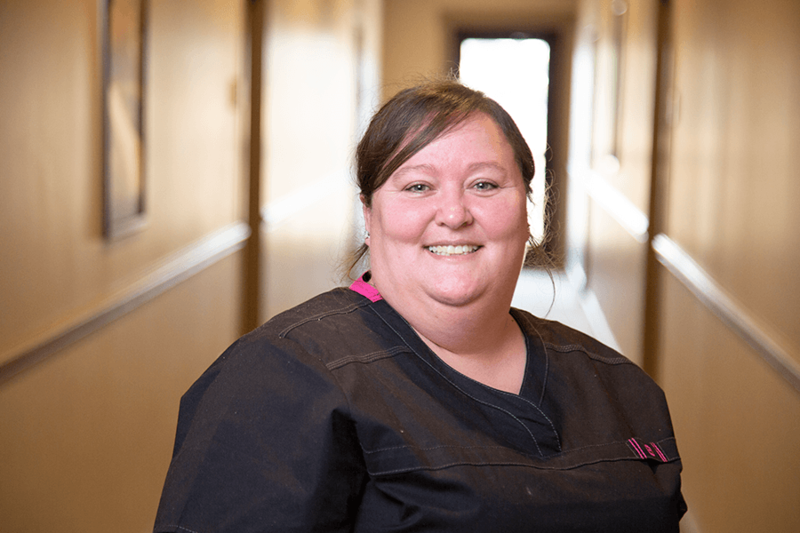 Recognized by her peers for her passion and enthusiasm for her work, Nurse Krista Hartfield, LPN, was honored as Oxford Treatment Center’s 2018 Employee of the Year. The award was given to her by Medical Director Dr. Stephen Pannel, at the center’s January staff meeting. As a nurse, Hartfield primarily works in withdrawal management unit at the Oxford Treatment Center. Her position involves monitoring the physical and vital signs of patients. My patients are my inspiration. The around-the-clock supervision and attention to patients might make it the most demanding unit at the center. For Hartfield, the challenge is worth it. Hartfield has been a member of the Oxford Treatment Center staff for five years. She previously worked as a nurse at an assisted living center and at a medical clinic. When asked what motivated her to transition into the field of addiction treatment, she said that it was compassion for others and the loss of a family member to addiction. Hartfield says working in the addiction treatment field has taught her a lot about the disease of addiction. She says her work has also changed her perspective on those struggling with addiction. “I have become more sensitive, more compassionate,” she said. I hope to help others understand: Those struggling with addiction are everyday people, normal people. Seeing the progress that a patient makes is the most rewarding part of the job, Hartfield said. She says seeing a patient return as on alumni visit later is the best gift. Robust alumni programs at the Oxford Treatment Center include monthly meetings, quarterly events, and a yearly alumni weekend where alumni and their families are invited to return to the center for fellowship and reflection. “It means a lot to see people get to where they want to be in life,” Hartfield said.